The first Open event of the season at Paris always promises to bring some surprises. With a strong entry of competitors, all players were eager to get on court and see what the event would bring – especially after some of the upsets in the men’s draw. Kicking off the tournament was Saskia Bollerman v. Lea Van Der Zwalmen. With Lea having recently taken up the game a couple of months prior, all spectators were eager to see how the Ladies World Rackets Champion played in her first major ladies real tennis open. The first set was nip and tuck all the way. Saskia managed to take the first set 6/4 due to some accurate forcing. The second set was filled with the same high quality tennis from both players. Ultimately, Saskia’s experience and shot selection won through and she proceeded to win the second set 6/3. Up next was Claire Fahey v Alex Garside. Claire dominated the match with precision and power and took everything Alex threw at her in her stride. Unfortunately, Alex was unable to win a game after fighting hard and taking the current world champion to deuce twice. Tara Lumley was off to a great start against Izzy Candy – quickly advancing to a 5/0 lead. Izzy managed to find some rhythm and won 3 consecutive games in a row. At 5/3 Tara dominated the service end and managed to close out the set. The beginning of the second set was close, with both players fighting for each and every point. Relentless retrieving and dominance at the service end saw Tara proceed to the semi final, 6/2 in the second. The last quarter final saw Penny Lumley battle it out against Jess Garside. With Penny not missing much and not giving Jess many loose balls, she rocketed off to a great 6/0 start. Retaliation from Jess saw her win the first game of the second set – she was on the score-board. Jess proceeded to serve well and find excellent length on the Paris court (almost unheard of!) and the games were becoming closer – 3/3 in the 2nd set. Jess clinched a 4/3 lead with some precision returning and great retrieving and managed to get herself a 40-30 lead. But Penny, well-experienced in delivering under pressure, managed to take back the game and win it 4/4. Penny managed to close out the match 6/4 – an excellent game to watch. The first singles semi-final was Claire v Tara. With Claire having not yet lost a game in the tournament the goal was clear. Tara fought hard to win 2 games, delivered some excellent returns and retrieved well from her backhand corner but Claire managed to win through to the final 6/1 6/1. The other semi final between Saskia and Penny was a lot closer. Saskia shot out of the starting blocks and dominated to a 5/0 lead in the first set. Penny managed to up her game and won 5 consecutive games in a row – 5/5 in the first set. Saskia buckled down and deployed all her strength and power to take the first set 6/5. A 1/1 start to the second set there was nothing in it. Saskia snuck ahead to a 3/2 lead and managed to re-find some rhythm that she had at the beginning of the match. After this, there was no real opening for Penny to get back in the match and Saskia won through to her first open final, 6/2 in the second. The final saw Claire off to a good start. Some loose railroads allowed Saskia into the match to win a game 2/1. Claire accelerated ahead and forced some errors from Saskia leading to a 6/1 first set lead for Claire. Saskia answered back and led the 1st game of the second set 40-0. But Claire wouldn’t give it to her and managed to extend her lead to 5/0. A late comeback from Saskia allowed her to steal 2 games. Claire closed it out and won the title – adding another one to her growing list. 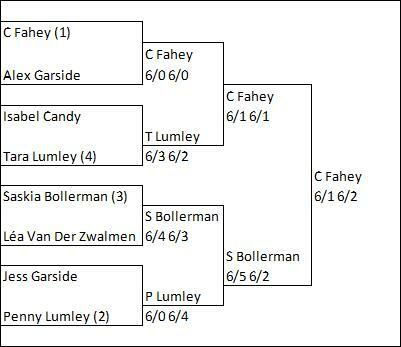 In the doubles, Fahey/Bollerman v Garside/Candy was the first semi final. A good start by Alex Garside/Candy but the hard hitting and tight railroads from their opponents proved too much. Some close deuce games but to no avail – Bollerman/Fahey through to the final 6/0 6/0. The other semi final was a lot closer. A major upset saw Zwalmen/Jess Garside knock out the number 2 seeds 3/6 6/3 6/3. A great match with the Lumley team struggling to put away the ball on the bouncy Paris court. The Zwalmen/Garside combination did some great retrieving and won through to the final. Unfortunately Zwalmen/Garside were unable to win a game against Bollerman/Fahey and the title was won 6/0 6/0. A great tournament all round, both competitively and socially, combined with the opportunity to watch some world-class tennis from the men.